Posted 12:13 am by sawatsky-group & filed under Tips. 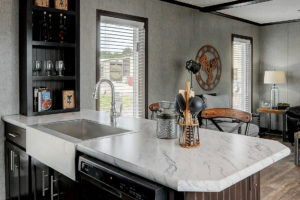 Quality laminate countertops like the ones Best Buy Homes uses are durable, look beautiful, and make your home more affordable, as opposed to granite countertops. However, there are a few tips we have in taking care of laminate countertops that are important to know in order to help them last long, and keep them looking brand new! Laminated countertops will burn or de-laminate if hot pots or pans are placed directly on the surface. Protective potholders should be used if the hot items are to be placed on the countertop. Electrical appliances may also require protection when in use. You can use counter protection mats which are super inexpensive, and will protect your countertops for years to come! The damage caused by hot items is generally not repairable so it is best to err on the side of caution. Abrasive cleaners or steel wool should not be used, as the surface of the laminate will scratch. The ability to withstand scratching does vary depending on your countertop. It is also a good idea to stay away from using household bleach or solvents as they can stain or discolour the laminate. Try not to leave water sitting on the countertop, especially in the seams, as this will result in the substrate of the countertop swelling due to the excess moisture. This damage can be irreversible. Clean the surface of plastic laminates with a damp, soapy cloth or sponge. For stubborn stains, use a mild household cleaner and rinse thoroughly with clear water. Our laminated countertops are high quality, and very durable, but it is always a good idea to take the best care possible to ensure that you are enjoying them for years to come! Check out our hones with stunning countertops here.